Order your 1,000 round case (20 boxes with 50 rounds each) of Sellier & Bellot 9mm Luger rounds now for all your range and target shooting needs! Czech-based S&B is one of Europe's oldest ammo manufacturers and has earned a strong reputation among American shooters for producing inexpensive but high quality ammunition. This non-corrosive ammo uses 115gr. full metal jacket bullets and Boxer-primed reloadable brass casings. As a standard-pressure load, this ammo is a favorite for range practice among shooters of compact pistols such as the Kahr CW9, S&W M&P Shield, Sig P938, and Colt New Agent. In accordance with AmmoMan.com's guarantee of free shipping for orders over $99, the price listed is the only charge you have to pay--there are no hidden handling fees. Very accurate and clean and their compact packaging is awesome! Great range ammo...AmmoMan fast shipping is a bonus. My favorite range ammo, never any issues. Price is right and the quality is there. No cycling issues. Will purchase again if the price stays reasonable. Ammoman is of the highest quality when it comes to vendors. So far have fed 350 rounds into my Walther PPS M2. Seamless!! My m&p eats it just fine. Price was right. And I buy all my ammo through you. Ammoman is my goto vendor!! Very good choice for my, came in 3 days, price was great. I went through initial break in of new Walther of 300 rounds. No issues at all yet. Will order another 1000 and repeat. Next gun will not be a 9mm and will decide at that point what to purchase, but this is a winner so far - Keep em straight! Went through a case of 1000 pretty quick. No misfires, jams, etc. Accurate and not too dirty. Very pleased with this purchase. Cycles great in my Glock 19. Bonus: Because of the higher muzzle energy, I tried this in my Dad's 1939 Luger P-08, which had cycling issues with American 9mm ammo. So far I've shot 10 magazines with this round and had zero issues. With Remington UMC 9mm, I was having issues at least 1-2 times per mag. I call that a win! No problems runs great in my sig320 needs to be packaged better was torn open when arrived but was.ok clean ammo too. The wife and I have shot thousands of rounds of S&B in 9mm. Flawless in Sig, CZ, Glock. On this last order, the individual boxes were pretty beat up, almost falling apart. Ammo was great as always, though. Dependable, never a misfire or malfunction in the many 1000s of rounds I have fired. literally less than 24 hours from the time I placed my order till FEDEX truck pulled into the drive. How? crystal ball? great service, AGAIN! Was concerned all I could find was Luger shells for my 9mm. But they fired great. Will buy again. This is great ammo and will continue to buy it. I actually was surprised to receive my order so quickly. I ordered it late on a Friday afternoon and it shipped out same day. Great job guys. All around great product from great supplier! Consistently high quality, clean, no FTF. I trust Ammoman to have good deals when I need ammo. I like dealing with them. You get what you order. 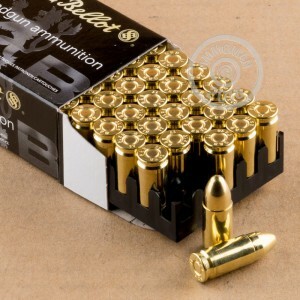 I have been shooting Sellier & Bellot for years and it has always been top class ammo, be it pistol or rifle rounds. Ammoman sells it at the right price. I ordered a 1000 and it was on my doorstep in three days. I have not even shot this batch of ammo yet because I have shot many rounds of it in the past and know it is good stuff. I like to save the good stuff and shoot the "other stuff first." 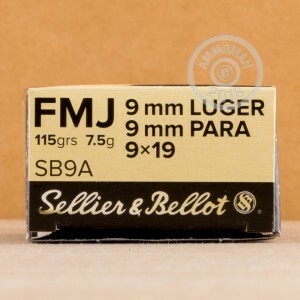 Sellier and Bellot and Ammo Man, good ammo and good people to by ammo from at a fair price. Awesome product Even better price! Bought 1000 rounds for my sig p226, shot 400 rounds the other every one was perfect! Thanks so much, on my way to buy more! I like to keep my skill level up......my former profession showed me how many dirtbags are out there. This ammo is affordable and quality stuff. Shot 50 of these through my Glock 23 gen 4 with a Lonewolf 40 to 9 conversion barrel and 9mm recoil spring. Absolutely no failures while shooting fast or slow and they all ejected between 1 and 4 o'clock which I can't say about 5 other ammo brands I tested. Great product and quality components. Ordered on Monday arrived by Thursday. Went through 200 rounds this weekend and had no problems. Shoots clean and very reliable in my H&K VP9. Great range ammo and what a deal on price ! Like others have said in there your reviews, I have shot thousands of rounds with this ammo and it ALWAYS fires and burns very clean. Unless I'm carrying a weapon for personal protection (in which case I would only carry JHP) the S&B ammo is the only ammo I like to shoot at the range, in competition or out in the country plinking ! Just about to finish off the 1000 rounds I bought a year ago, perfect timing for this to come in. Burns nice and clean, consistently high quality. Compact packaging and from Czech Republic. always been a fan of S&B ammo. its never let me down. thanks for the quick shipping ammoman!!!!! Some of the best 9mm ammo I've shot! I have gone through thousands of rounds of this and it has been fantastic. Shoots clean and accurate. No jams. I have shot several thousand of these and they did outstanding. I have since loaded the brass many, many times with no problem. It load well and is good brass. Best deal going, second order, will buy again. Never had a misfire or jam. Great ammo, no jams or fouling. Clean ammo to shoot. Ammoman.com is always my go to for ammo. Best place I have found thus far. Have never had an issue with this brand. no FTF, etc. Great target ammo. Never a problem. Clean burning and reliable. Very compact packaging - a big plus! I've shot a few thousand rounds of S&B 9 and love it. An added benefit is that their packaging is really condensed so you can stock up without taking up as much closet space.